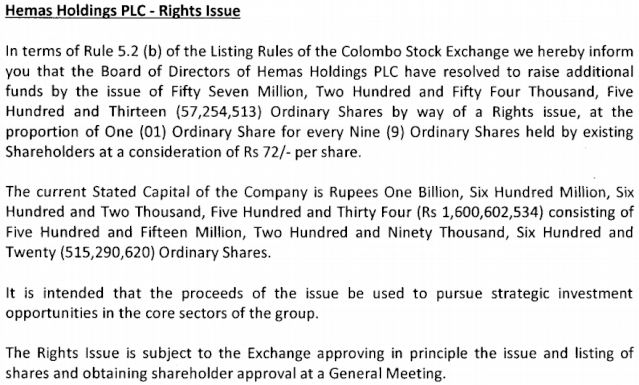 Hemas Holdings PLC, a diversified conglomerate quoted on the Colombo Stock Exchange is seeking a cash infusion of over Rs. 4.1 billion through a rights issue of nearly 57.3 million new shares to be issued in proportion of one new share for every nine held at a price of Rs. 72 per shares. In a Stock Exchange filing made on Friday, Hemas said that it intends to use the proceeds of the rights issue, which will be subject to shareholder approval at a general meeting and the agreement of the CSE in principle, will be used "to pursue strategic investment opportunities in the core sectors of the group." Hemas currently has a stated capital of slightly over Rs. 1.6 billion comprising nearly 515.3 million ordinary shares. The group’s current businesses include fast moving consumer goods (FMCG), healthcare, leisure, transportation and others. The Hemas share closed on Friday at Rs. 85. Sri - where do u get that link to get a chart and do what if calc? Then in tools drop down menu select "What I have invested?" Note: Just change the CSE symbol in the above link for other counters. Very smart move by the owning family. bring in Enderby, get confidence of Foreign Investors, drive up share by over 100 %, come up with pricey rights to fund future development and then last step ? sell their rights totally approx 55 million share rights @ ......? or at least partly maybe. i will bet that the owners will not take up their (Rights) entitlement and will choose to sell their rights. may have lined up potential buyers. so you kill 3 birds with one stone. a. company gets cash for development / settling debts. b. owners get some chips off the table at good price / value. c. share liquidity is enhanced. If they are actually thinking like you they are smart. The Alchemist wrote: Very smart move by the owning family. slstock wrote: If they are actually thinking like you they are smart. I think owners now may have thought after seeing this what options they've got..
A massively overpriced counter by now, Should sell and run away from this one.